When you are trying to buy the market's best stocks, it's worth checking up on your companies' free cash flow (FCF) once a quarter or so, to see whether it bears any relationship to the net income in the headlines. That's what we do with this series. Today, we're checking in on Tenneco (NYS: TEN) , whose recent revenue and earnings are plotted below. 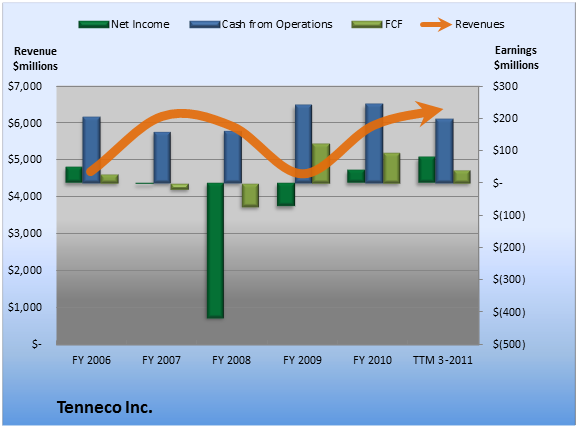 Over the past 12 months, Tenneco generated $39.0 million cash while it booked net income of $79.0 million. That means it turned 0.6% of its revenue into FCF. That doesn't sound so great. However, FCF is less than net income. Ideally, we'd like to see the opposite. Since a single-company snapshot doesn't offer much context, it always pays to compare that figure to sector and industry peers and competitors, to see how your business stacks up. 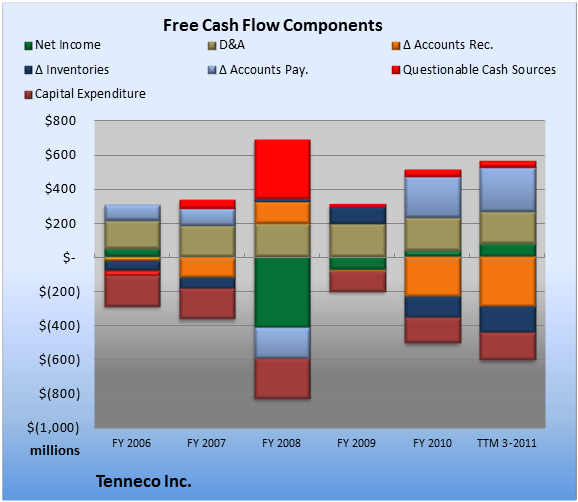 So how does the cash flow at Tenneco look? Take a peek at the chart below, which flags questionable cash flow sources with a red bar. With 19.7% of operating cash flow coming from questionable sources, Tenneco investors should take a closer look at the underlying numbers. Within the questionable cash flow figure plotted in the TTM period above, other operating activities (which can include deferred income taxes, pension charges, and other one-off items) provided the biggest boost, at 13.1% of cash flow from operations. Overall, the biggest drag on FCF came from changes in accounts receivable. Tenneco investors may also want to keep an eye on accounts receivable, because the TTM change is 2.9 times greater the average swing over the past 5 fiscal years. Add Tenneco to My Watchlist. Add Autoliv to My Watchlist. Add TRW Automotive Holdings to My Watchlist. Add BorgWarner to My Watchlist. At the time this article was published Seth Jaysonhad no position in any company mentioned here at the time of publication. You can view hisstock holdings. He is the co-advisor ofMotley Fool Hidden Gems, which provides new small-cap ideas every month, backed by a real-money portfolio.Motley Fool newsletter serviceshave recommended buying shares of BorgWarner and Autoliv and creating a bear put ladder position in Autoliv. Try any of our Foolish newsletter servicesfree for 30 days. We Fools don't all hold the same opinions, but we all believe thatconsidering a diverse range of insightsmakes us better investors. The Motley Fool has adisclosure policy.